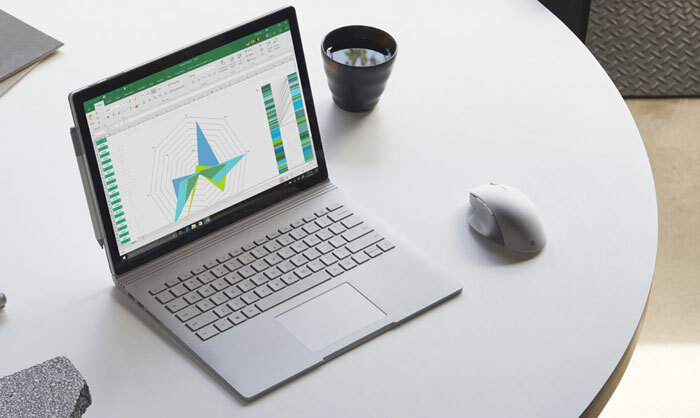 Microsoft hasn’t only launched its new Surface Book 2 convertibles, and released the Windows 10 Fall Creators Update, it also revealed a new Surface Precision Mouse which is designed “for exceptional accuracy, comfort, and control”. The Microsoft Surface Precision Mouse offers dual connectivity modes; you can use it wired, via USB 2.1 or newer, or wireless via Bluetooth LE 4.0/4.1/4.2. Both interfaces can be active at the same time facilitating multitasking across up to three computers. 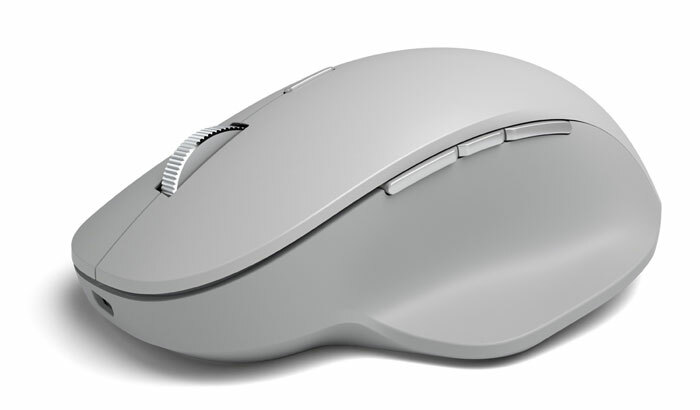 Six buttons are present on the Surface Precision Mouse. Microsoft highlights the usefulness of three thumb buttons – these aren’t set in functionality, you can customise them to various commands as you wish (using Microsoft’s Mouse and Keyboard Center Software – not available for Windows 10 S). Obviously with the thumb button placing and shape sculpting, this design is aimed at right handed users, sorry sinistrals. The other three buttons available are the regular left and right mouse buttons and the scroll wheel. The new mouse measures 122.6 mm x 77.6 mm x 43.3 mm and weighs in at 135g including its rechargeable batteries. Incidentally batteries will last about three months of typical wireless usage. Microsoft’s Surface Precision Mouse is compatible with Windows 7 (USB mode only), Windows 8.1, Windows 10 and Mac OSX. The attractive Microsoft Surface Precision Mouse will be available for pre-order from 9th November. It is advertised with an MSRP of $99. If you are a fan of Microsoft’s IntelliMouse designs you might be pleased to hear that the new Microsoft Classic IntelliMouse is “coming soon”. Unfortunately there’s very little information available about this reanimated classic. Microsoft has yet to create a dedicated product page, just listing it with an overview text alongside the new Microsoft Surface Precision Mouse on its Surface accessories page. What we do know is that the new Microsoft Classic IntelliMouse is “inspired by the Microsoft IntelliMouse 3.0,” and it offers a firm scroll wheel action plus precise control, with a DPI range up to 3200. Let’s hope for Windows XP era pricing to accompany this stripped back design. Nuts price and several equally nuts design decisions. Micro USB, really?! If ever there is a use for USB-C it's a brand new mouse designed for an ultra-modern brand. Also please tell me I can replace the battery - I can't see any compartments which suggests it is charged via the USB cable and isn't user-replaceable (even more reason not to spend £100 on it). Just use an AA battery or 2! The Logitech Performance MX (and presumably its successors) has the perfect system. A wireless mouse that can be tied by a cable which charges the replaceable battery. How hard can it be? The Logitech Performance MX (and presumably its successors) has the perfect system. A wireless phone that can be tied by a cable which charges the replaceable battery. How hard can it be? lol 99 quid, I was expecting 20 or maybe 30 max and that would have been taking the mick a bit! 3 thumb buttons is great but these are poorly placed. Not a mouse for gaming and with that price tag, not a mouse for the office.